In the beginning of the story the main character, Raina, had a girls scout meeting and after the meeting her friend's mom decided to drop her off. When Raina had arrived home her friends decided to walk her to home, then her friend decided to have race when Raina and her friends were running Raina tried to pull her friends shirt but she failed and trip. When she tripped she landed face first and she knocked one tooth put and the other tooth was pushed into her gums. When the accident happened her mom took her to the dentist and that's where her journey to get her new teeth started. First the dentist puled down the tooth that was stuck up in her gum and put her missing tooth in or at least tried to and then they put a gauze. After a few days they took the gauze out and it turns out she broke the bone where her tooth was stuck up on. Raina was stressed because she was worried of what people would think about her since she lost 2 teeth. After a while the dentists gave her retainer so she could have normal teeth for a temporary while. Then the news she got was that she needed to get BRACES! When she heard that news she was so worried because she was worried about other peoples opinions. When she got her braces her "friends" started making fun of her. After a while she got fed up and left her friends and made new ones. Finally after almost 2 years of having braces she got them took off and she wasn't so pleased so then they put bonding to make her teeth look more shaped. This story connects with the world because there are some people who have or are passing through situations like this. Also people in the real wold feel self conscious about their selves. When the people are self conscious about their selves they take other peoples comments really serious like in the book Raina took her friends negative comments really serious. Finally this relates to the world because people have fake friends. I would recommend this book to others because its funny and it relates a lot to the real world. Also i would recommend this book to others because people can learn from it. I think my friends would like this book. 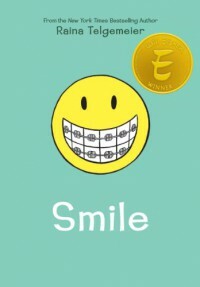 I think my friends would like this book because one of my friends had braces and shes told me about how it felt but she has got then taken off. Also my friend would like this book because she is going to get braces on and since my other had braces they've been talking about it a lot and the book related to both of them two in a way.